We’d love your help. 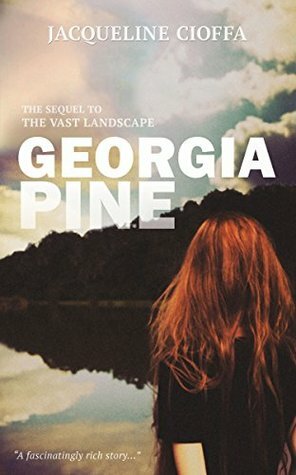 Let us know what’s wrong with this preview of Georgia Pine by Jacqueline Cioffa. THE VAST LANDSCAPE continues, alive in memory. The gatekeeper, fixer of Harrison’s family, Georgia Pine. Faint whispers drift from the stars into the evergreen, cottage bedroom. The Cove, a mystic beach, granddaughter’s refuge. The sea, sun, stars and moon welcome their return. The crimson child, with blazing hair and fire belly will do as she’s told, not before she’s read THE VAST LANDSCAPE continues, alive in memory. The gatekeeper, fixer of Harrison’s family, Georgia Pine. Faint whispers drift from the stars into the evergreen, cottage bedroom. The Cove, a mystic beach, granddaughter’s refuge. The sea, sun, stars and moon welcome their return. The crimson child, with blazing hair and fire belly will do as she’s told, not before she’s ready. Pyre and brimstone, locks of ginger, gut instinct to guide her. To ask other readers questions about Georgia Pine, please sign up. I finished this book just as Adele's new song "Hello" hit the airwaves and if there is ever a playlist for this book / author, Adele has to be in it. Seriously. The combination of both is mesmerising. Jacqueline Cioffa ensures you're holding a page turner which will make you question your own family life and relationships. Strength plus passion plus a whole lot of emotion. Imperfection versus expectations. That's what this book was about. Georgia Pine describes the many complication human relati I finished this book just as Adele's new song "Hello" hit the airwaves and if there is ever a playlist for this book / author, Adele has to be in it. Seriously. The combination of both is mesmerising. Jacqueline Cioffa ensures you're holding a page turner which will make you question your own family life and relationships. Strength plus passion plus a whole lot of emotion. Imperfection versus expectations. That's what this book was about. Georgia Pine describes the many complication human relationships which stem from what we expect others to do or from how we expect them to be. A powerful read in which the main character embraces maturity. Beautifully written sequel to Jacqueline Cioffa's debut novel The Vast Landscape. Loved them both. Greatly appreciate the opportunity to read more of Cioffa's writing. As I have been living the joys and losses of life, of loving an adolescent child and aging parents, this novel helped me grieve a bit, shed a few tears, tears I need to let loose. Thank you, Jackie. Jacqueline Cioffa was an international model for 17 years and celebrity makeup artist. She is a dog lover, crystal collector, and Stone Crab enthusiast. Author of the raw, riveting and brutally honest memoir, "The Red Bench," and the poignant soul-stirring saga, "The Vast Landscape" and "Georgia Pine," Jacqueline's work has also been widely featured in numerous literary magazines, and anthologies. Jacqueline Cioffa was an international model for 17 years and celebrity makeup artist. She is a dog lover, crystal collector, and Stone Crab enthusiast. Author of the raw, riveting and brutally honest memoir, "The Red Bench," and the poignant soul-stirring saga, "The Vast Landscape" and "Georgia Pine," Jacqueline's work has also been widely featured in numerous literary magazines, and anthologies. She's a storyteller, observer, truth teller, essayist, potty mouth, beauty enthusiast and film lover who's traveled the world. Living with Manic Depression, she believes passionately in using her voice to advocate and inspire others.